Copulas provide a means of simulating returns for multiple assets where individual asset return distributions are specified independently of the dependence structure between the assets. A key strength of copulas is their ability to handle distributions and dependency structures other than those based on the assumptions of normally distributed returns and simple linear correlation. This is important for modelling financial returns which often exhibit fat tails and strong lower tail dependence, where the correlation between asset returns is higher during market downturns than during market upturns. Traditional analytic and simulation models do not capture these non-normal returns and asymmetric dependencies. The Finance Add-in for Excel currently implements two elliptical copulas (Gaussian (normal), and Student t) and one Archimedean copula (Clayton). All copula functions are multivariate. Copulas, such as the Student t copula (symmetric tail dependence) and the Clayton copula (asymmetric positive lower tail dependence) can be calibrated to actual historical data and then used to simulate returns and dependencies between assets which more closely reflect the real financial world. 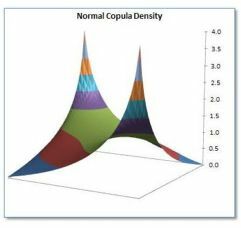 Copulas therefore provide much more power and flexibility than traditional simulation methods based as they are on the assumptions of multivariate normal distributions and simple linear correlation. The Hoadley Finance Add-in for Excel includes a set of software tools for calibrating individual assets (called marginals) and copulas from historical data, simulating copulas, and generating returns for Student t, or normally distributed marginals. The software can also be used to generate lognormally distributed prices (ie prices which follow a geometric Brownian motion process) with a dependency structure determined by the characteristics of the copula. Copula functions can be called directly from worksheet cells or used from VBA modules. Using copulas with VBA is the more practical option for large simulations. An additional samples spreadsheet available for download provides examples of using the software, both from worksheet cells and from VBA modules. The copula software in the Finance Add-in for Excel is designed to enable the flexibility of copulas to be easily utilized. All tools can be used directly from worksheets or called in VBA modules. All copula functions are multivariate. Calibrating the marginal distributions. This involves selecting the most appropriate distribution for each marginal (ie asset) independently of the distribution of other marginals and, in the case of Student t distributions, calculating the degrees of freedom for each marginal from the historical data. Marginals can have a normal or student t distribution, or, if a specific marginal distribution is not clear cut, the distribution can be specified as "empirical". Calibrating the copula. This step involves selecting the most appropriate copula and calibrating the copula (ie estimating various copula-specific parameters) using historic data. Simulating the copula. The simulation step involves generating a large number (eg 50,000) uniform random variables for each marginal with a dependency structure determined by the type of copula used and its parameters calibrated during step 2. The Add-in includes a function for each type of copula. Importantly, the marginals -- ie the distributions of the individual assets -- are not specified at this stage. The copula is completely independent of the marginal distributions that will be generated from the copula during the next step. Generating the marginal distributions. The final step is to generate returns for each marginal using the simulated copula from step 3. The marginals can be normally distributed or Student t distributed. Lognormally distributed prices an also be generated for multi-asset option valuation and other purposes. Marginal returns are generated independently from each other (marginals do not need to all be based on the same distribution), and independently of the dependencies which exist between the marginals. The dependency structure between the marginals -- ie the multivariate distribution structure -- is determined solely by the characteristics of the copula. There are functions in the Finance Add-in for Excel for performing each of the above four steps. Use of copulas is becoming widespread in risk management applications. One of the most common applications of copulas is in estimating Value at Risk (VaR), because of the focus on extreme losses. The Finance Add-in for Excel's copula functions are tightly integrated with the add-in's Value at Risk simulation component which greatly simplifies their use in estimating VaR. When simulating VaR the user can choose between traditional Monte Carlo Simulation, Filtered Historical Simulation (FHS), or simulation using any of the copulas. 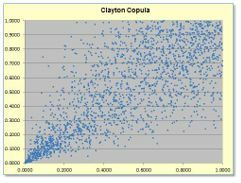 The Value at Risk (VaR) additional samples spreadsheet and the VaR Simulator application both demonstrate the use of copulas with the VaR simulation component. See Overview of VaR, and the VaR Simulator for more information on using copulas for VaR simulation. For the application of Conditional Value at Risk (CVaR) simulated using copulas in asset allocation (portfolio optimization) see Mean-CVaR Optimization. The copula tools are included as part of the full version of the Hoadley Finance Add-in for Excel. The add-in contains sample worksheets demonstrating the use of each of the functions and components. An additional samples spreadsheet illustrating the use of copulas can also be downloaded from this site. This spreadsheet contains worksheets illustrating how copulas can be calibrated and used in spreadsheets and in VBA modules. 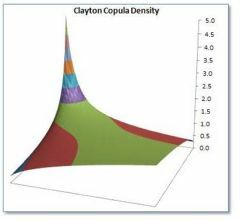 The additional samples spreadsheet allows you to vary key parameters, such as degrees of freedom for Student t copulas, and alpha (correlation coefficient) for Clayton copulas, and to observe the impact on the copula dependency structures and copula densities graphically. This is useful for gaining an insight into how the various copula parameters interact and their sensitivities. The images on this page illustrating copula densities and distributions were generated using the additional samples spreadsheet. Examples using copulas to value mult-asset options (eg spread options) and the use of copulas in estimating value at risk (VaR) are also included with the additional samples. The Copula software is included in the full version of the Finance Add-in for Excel. Corporate (business) use: Corporate/commercial license enquiries. .